One of the busiest teams since the 2018 league year began, the Los Angeles Rams bolstered their defense, shipped away a playmaker (or two) and brought back key players who put forth career years in 2017. While we wrote about their aggressive offseason moves earlier this year, after their signing of Ndamukong Suh, the Rams are firmly on the radar for a deep and lengthy playoff run in 2018. 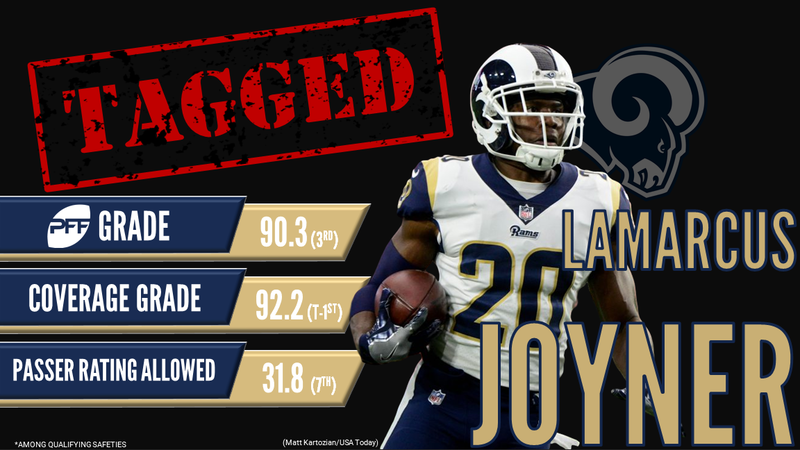 Perhaps going under-looked, is their franchise-tagging of cornerback-turned-safety Lamarcus Joyner who registered a career-high 90.3 overall grade last season. Joyner is joined by Marcus Peters, Aqib Talib, Nickell Robey-Coleman and burgeoning star in second-year safety John Johnson III to arguably form the league’s best secondary as a whole while also holding the league’s top interior defender duo in Suh and Aaron Donald. With their aggressive offseason approach, the Rams have set themselves up to have a successful 2018 campaign while they can also look to the draft to add some depth and a key player or two at certain positions that could become an upgrade. What do PFF Senior Analysts Steve Palazzolo and Sam Monson think of their offseason so far? Subscribe to our PFF YouTube channel for more content including State of the Franchise videos after each team’s free agency moves this offseason.